Yesterday was the day for cleaning the bedrooms, and to be honest, it kind of got the better of me. Besides there just being a lot to do, I couldn't do anything with Espen's room or the guestroom next door while he was napping, without risking waking him up. And with Espen not being one of those babies who naps happily to the sound of the vacuum cleaner, I had to keep that quiet too. It was kind of trickyl! But, I did what I could: in our room I decluttered the dresser (seriously, we should not be allowed flat surfaces! ), I put away clean laundry and did another load, I dusted and generally picked up as much of the room as I could in whatever short bursts I could had. I was really kind of dragging and feeling unfocused and unmotivated, though. I think having three rooms to do made it so I drifted back and forth between them without really accomplishing much. The guest room should have taken about 20 minutes tops, and I still haven't finished it yet. I did put a few things away and wash the sheets, but they still haven't made it back onto the bed yet. Oh well. At least I managed to vacuum the entire upstairs after Nick came home and could console Espen, who is not a fan of the mighty vacuum cleaner. Above is the view from the door. The light isn't all that great because I took these photos in the late afternoon when the sun was streaming in the window. But you get the idea! Nick's mother sewed the curtains, and I am so pleased with how they turned out! One of my very favourite things in Espen's room is the mural above his crib. We ordered it from Simple Shapes, and I am so happy with how it looks. I'm typically really not a big fan of vinyl decals (sorry! ), but we wanted something for the walls above his crib, but needed to make sure it was something Espen couldn't pull into his bed, or that might fall on him. And his tree really is perfect. The blanket was crocheted by a friend. I really love being able to add thoughtful little touches like that to the room. This is just a detail of the tiny wall between the door and the closet. 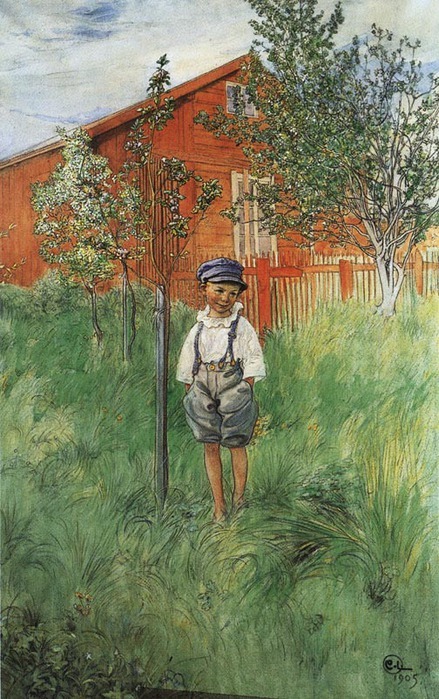 My mum gave Espen the hooks, and the picture is a print by the Swedish artist Carl Larsson of his son, Esbjörn. Which is incidentally the Swedish form of Espen. You can get a closer look here. This is the only unfinished space. I want to get a cool print to hang above the small table, but haven't found quite the right thing yet. The blanket hanging over the chair was made by Nick's now-100 year old grandmother. She made it for Nick when he was a baby, but Nick's mom thought it was too nice to use, and so she kept it safe for over 30 years, and now we are lucky enough to have it! I still think it's too nice and too special for Espen to crawl around on, so it's mostly decorative these days. And that's it! That's where our little guy sleeps and lives out his tiny human drama. Love all the cute, thoughtful touches to his room and the color you picked for the walls. I bet he loves his room. There's a simple joy in decluttering/straightening/cleaning. My friends think I'm kidding, but I've been known to take a day off just to have time to clean my house! I love his room! The colors look great and I love that little tree decal. Tamsin, I'm glad you're still a servicey type. Go you for putting all that effort for the newborn kit. Even though I didn't have to take my newborns home in newspapers, I got a newborn kit for my third one from the United Way. I LOVED every little thing in it and was especially grateful for the handwritten note inside in childish handwriting. Some mother and baby are going to be so much the better for your hard work...and money...and time. :) Oh, and btw, your little boy better be glad of all the effort that went into his room--it's gorgeous! My babies certainly never had their own room, nor were their sleeping situations so nice as his. 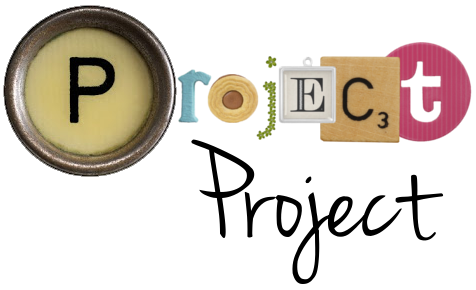 Project Service Project, August: Argh!